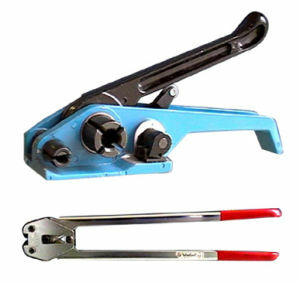 Combination tools function as tensioners, sealers and cutters. They save time by eliminating the handling of separate tools. 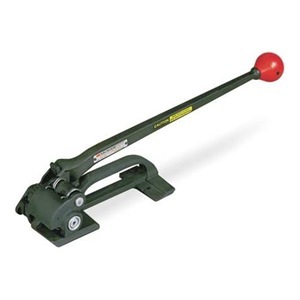 But weighing more than such tools, they should be placed as close as possible to the position where they will be used. Seal-feed combination tools carry a stack of seals in a magazine for fast, easy loading. 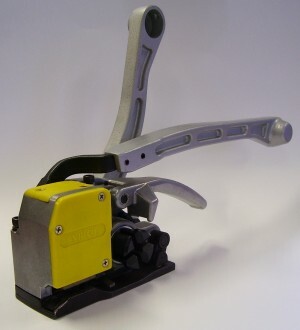 Tensioners - Signode pneumatic tensioners take most of the effort out of strapping large or compressible packages. 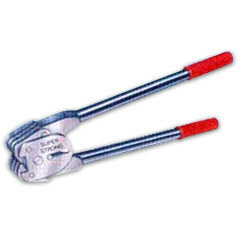 They also make tensioning uniform and precise through adjustment of the air pressure regulator. Sealers - Signode pneumatic sealers let compressed air do most of the work. They are used to achieve high production on heavy strapping, especially when seals are in awkward positions or whenever productivity must be maximized. Signode manual sealers provide positive sealing action with minimal effort. Light and durable, they lock strap ends into a high strength joint. Notch-type sealers cut into the seal and outer edges of the strapping, turning tabs down (down notch) or up (reverse notch).